Changed the format a lil’ – it makes more sense to talk about the rosters that have gotten worse today, and talk about the moves towards clearing space for Free Agency in 2010 tomorrow. So… switched ’em. Today: 2 teams that find themselves worse off. Big time free agency always has the crowd’s attention. But rarely do we look in depth at the teams those free agents depart, and what’s the effect of their departure. Today, we will. The Golden State Warriors hurt in many different ways with the departure of Baron Davis for the Clippers. On the court, Davis was the team leader, and of recent times the best performed of the Dubs players. Davis was the guy that on any given night could be the man. The guy the opposition couldn’t touch. Off the court, “The Beard” was the face of the franchise. Without a doubt the guy that you saw in your mind’s eye when someone said “Golden State Warriors”. Post the June 30th opt out from Davis, the Warriors chased their tails, offering a big contract to Arenas, amongst others. Thankfully for Golden State, Arenas chose to stay with Washington (more on that later). Whilst not one of the key players on the GSW’s roster, Barnes had a certain rapport that he’d built up with the fans at the Oracle Arena. Definitely that guy that the crowd love, the guy who’s most likely to do something to win the heart & soul of the fans at the game. Headed to division rivals Phoenix? There’s probably only one destination that could hurt more (nod to LA at this point). Signing Ronny Turiaf from the Lakers will help a lil’ – but no where near enough to damn the torrent of talent heading out of Oakland. It’s still hard to believe that the Warriors would be without The Beard, but move on – sign Corey Maggette, work the youth, and the opportunity for Monta Ellis to make an impact. Ellis is one of most dynamic young players in the NBA would finally get a chance to be the centerpiece. Ellis could lead this … ouch. Can’t a franchise get a break? Monta Ellis tears the deltoid ligament in his left ankle, and post surgery will be out 3 months. The injury occurred during a pick-up game. 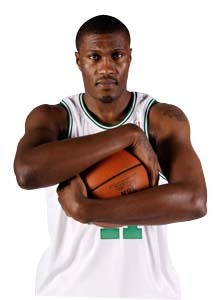 Decent talent, and might fit in with the Golden State mindset… but Maggette’s always been a ‘me-first’ kinda guy. We’re yet to see how he’ll fit in with “someone else’s team”. And this team belongs to Ellis. At least… it will when he gets back. Cleveland faithful have been waiting. 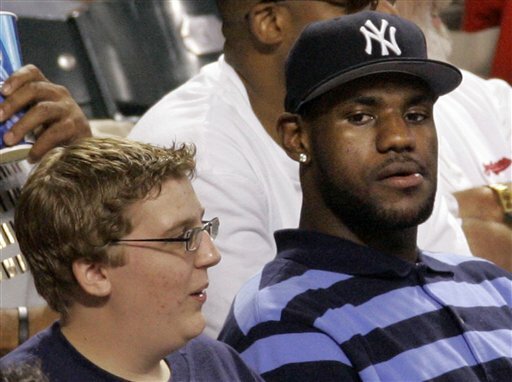 Waiting for a team that could compete… then came LeBron. Initially, it was just waiting for the pieces to be put in place around Air Apparent LeBron James that would bring them home an NBA title. Now, they’re waiting for Danny Ferry to put the pieces around LeBron James that might just persuade him to stay in town in 2010. For LeBron forms the centerpiece of free agents who become available in 2010. And whilst every Cleveland Blog/fan I know swears differently, every single last one of them is scared of what might happen, whether they’re willing to admit it or not. There are signs there, it’s just if you choose to read them as signs, or coincidence. So who do the Cavs sign? Mo Williams. Now, Williams is a pretty good point guard. One of the better 2nd/3rd tier guys out there. But it’s not as if signing him puts them over the hump. Yes, some will point to the fact that Cleveland came a lot closer to beating Boston than the LA Lakers did. And this is true. But that had more to do with the way that Boston was playing than anything else. In the East, Cleveland finished last season with 45 wins. That wouldn’t have even got them into the playoffs in a stronger Western conference. The Cavaliers’ roster is rife with ‘just misses’ and ‘not quites’. Ben Wallace, Wally Szczerbiak, Delonte West, Daniel Gibson, Larry Hughes, Drew Gooden. All good players in their own right, but none coming close to being the 2nd guy that LeBron needs/desires. One thing’s for sure tho’, 2010 gets closer every day. Breaking news! 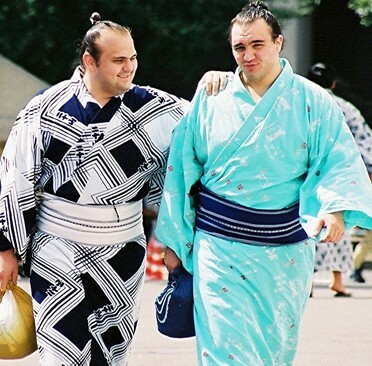 Two more Russian sumo wrestlers have tested positive for marijuana usage. Roho and Hakurozan, two Russian brothers, have appealed after having urine tests return positive for marijuana use. If the tests are found to be accurate, the two will face expulsion from professional sumo in Japan… something that Wakanoho found out last month. As mentioned last month when reporting on Wakanoho, although it may seem to many foreigners as an amazing exaggeration of what’s a decriminalized drug in most western nations, in Japan there’s no delineation between ‘hard’ and ’soft’ drugs. If found to be accurate tests, besides getting the boot from sumo, Roho (a komusubi) and Hakurozan (a maegashira) could face criminal prosecution, which given their status could possibly mean getting expelled from Japan. This is yet another hit to sumo, which has to be reeling from the constant trouble the sport’s members attract. This piece is a continuation of the ‘Impact on the hardwood‘ up yesterday… tomorrow we’ll put up a bit on the Free Agent market of 2010. Additionally, we’ll talk about teams that have gotten worse, and why – on the following day. July 9th, when Elton Brand officially signed with the Philadelphia 76ers was a gut-wrenching experience for anyone who wears the oft-frustrating label of “Clippers fan”. The day before, Clip-fans were excited as hell about having perhaps the best roster they’d had in many a year. 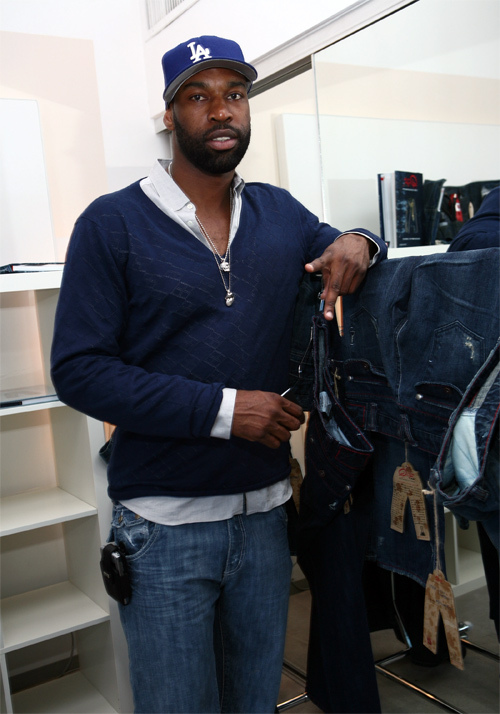 Brand had seemingly persuaded Baron Davis to come home and join the Clippers. The Clips had reason to celebrate, for only the second time in many, many years, it looked like LA’s second best had a team that might… just might compete with the co-tenants of the Staples Center. Brand’s mutiny quickly scuppered the Clippers’ dreams of fair sailing. His departure left not on the fan-base – but the franchise itself – dazed and confused, hurt and bitter. The LA Clippers seemed doomed for another year of non-competitiveness. It’s been very impressive the way they’ve rebounded from the mess they woke up to on July 10th. Regardless of the Brand move, the acquisition of Davis is a step up from what they had at the position. 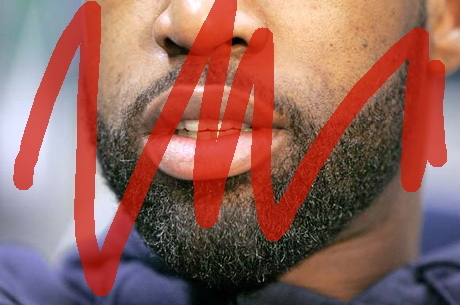 Baron Davis brings a veteran wiliness that the Clip have lacked for a damn long time. He’s a natural leader, tough, and a natural for LA… if he can stay healthy. The addition of Marcus Camby will give the Clippers a pretty scary frontcourt. Alongside Chris Kaman, scoring should be pretty hard for opponents of this team. Al Thornton’s a young guy who’s improving every time he takes the floor, and Cuttino Mobley could easily have made the underrated list posted here a little while back. Camby’s not Brand, that’s for sure. But with him in – if he can stay healthy, the Clippers’ defense should be stronger than with Brand. Adding Jason “White Chocolate” Williams to the roster was gravy – this is a team that could be playoff-bound. Maybe not near the top, but they’ll compete. And that’s good news post July 9th. The New Orleans Hornets made some mid-level moves that could have high-level repercussions. They came within a game of making the Western Conference Finals, losing to the Spurs in a series that many thought they could’ve won. This year, Chris Paul’s crew’ll be a little older. A little better for the experience. Add to the fact that New Orleans will be better merely by being a year older, they’ve added some important pieces to the puzzle. There’s no doubting – the loss of Jannero Pargo hurts, but James Posey’s presence more than counters that. Posey has the same skillset as Pargo, and then some. Additionally Posey brings a presence to the Hornets that was pretty much why they lost the Western Conference semi-finals to the Spurs. Whilst they are overpaying Posey, the Hornets needed him like they needed no other free agent on the market. He addresses the reason they weren’t in the Finals. Experience. Additionally, adding Bonzi Wells to the roster offsets that… although in different ways. Wells is a talent, there’s no denying that. The only issues that Wells has is a somewhat erratic temperament, and a like performance. If he could retain focus better, Wells would be hellishly difficult player to guard. Whilst Sean Marks is pretty much just a big body that will collect fouls, he does allow some minutes of rest to Tyson Chandler. That’ll be Marks’ job. Be big. This Hornets’ roster got a lot better by adding two key mid-level pieces… but they’ll have to be. The West’s still going to be wild ‘n’ wooley, and their own conference got a helluva lot tougher with Houston stepping up their game – but expect the Hornets to be amongst the cream. It’d be awful to be Dallas fan at the moment. The LA Lakers must be all smiles with the return of Andrew Bynum. It’s a mistake to look at this as LA merely getting a better center. In effect, they are getting not only a better center, but a better power forward, and a better player at what’s likely to be the 3 slot. Gasol’s game is more suited to the 4 than at center, and with Bynum’s return it means that Gasol can play his more natural game. He’s not a banger, never has been. He’ll still see minutes at the 5 – Phil Jackson won’t throw Andrew Bynum in the deep end. I’d expect Bynum to play 20-28 minutes a game initially, and Jackson might step it up from there. At least early on, Gasol and Odom might just play quite a few minutes at he positions they had last year. Not necessarily a bad thing: that tandem made a lot of other bigs in the very deep West look foolish. 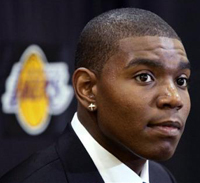 A lot of critics chastise Laker excitement on Bynum’s return, declaring him not to be the second coming of Wilt or Kareem. And that’s true. But Andrew Bynum’s clearly a better, tougher option than playing Gasol at center. And having players of that size and quality on the court at the same time is a roster option that very few other teams in the league have. Lamar Odom would seem to present a quandary for the Lakers. He doesn’t appear to be a natural 3 – which is another area the Lakers got beaten in the finals (destroyed?). But it’s too enticing a notion not to try – a guy with an almost point guard handle who’s 6’11 playing at the 3? Ok, so he doesn’t have range… but there’s also the option of playing Odom at the shooting guard spot, and Kobe Bryant at the 3. Or alternatively starting Radmanovic and having Odom lead the second unit. This is the kind of ‘problem’ that other franchises dream of having. Another team welcoming a big guy back to the fold is Portland. 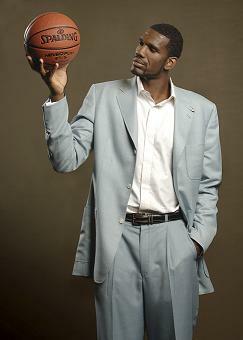 The Trail Blazers have eagerly awaited Greg Oden pulling on a game jersey for over a year now. Oden joins a roster that was amongst the most improved last year, and narrowly missed out on making the playoffs – without the most anticipated draft pick since LeBron James. Travis Outlaw has made huge ground, LaMarcus Aldridge must make Bulls fans cringe, and Brandon Roy is a leader with nous beyond his years. Add to that a rookie signing in Jerryd Bayless who’s perhaps the most underrated of the last draft’s crop – and with Oden joining them you have a team that’s going to be very good, for a very long time. This mightn’t be their year – expect teething issues – but Rip City’s back. This will be a piece in three parts, today – we’ll discuss the improved rosters of many of the NBA’s elite. Tomorrow we’ll continue to discuss improved rosters, and the return of injured players, and the day after – the Free Agent market of 2010. Quite a few changes to quite a few rosters over the off-season. It would seem that two things are evident: currently the gap between the ‘haves’ and ‘have nots’ is growing, and this seems to be directly in relation with some teams clearing cap space – or preparing to do so – in order to be competitive in what promises to be a very exciting 2010 free agent period. Many teams have already made moves to improve rosters – both within the free agent signing period (and this season was a frenetic time by any standards! ), and within the trade market. Rosters are also affected by injuries, and at least two teams will have to seriously adjust their early-season goals due to injuries to key players. Additionally, there are at the minimum two teams’ rosters are improving with key players returning from injury. Firstly – acquisitions. 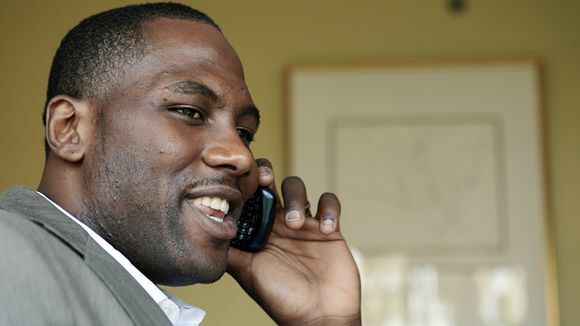 Of an off-season rife with impact movement, perhaps the biggest impact acquisition for any team was Elton Brand going to the Philadelphia 76ers. This free agent signing to the East strengthens a team that was already on the rise, and Brand’s addition should put them in the upper echelon of Eastern teams. Andre Miller and Andre Iguodala lead a squad that made the playoffs last year, and started the first round against the Detroit Pistons, a perennial power-house, and pushed them to six games. Brand, Miller, Iguodala and Dalembert will be the mainstays of this team, and expect Thaddeus Young to get increased minutes this year. Brand addresses a weakness Philadelphia had, a strong power forward. Funnily enough, the one thing the Sixers are now missing is the one thing they traded away last season: a quality spot-up shooter. But whilst Kyle Korver now calls Utah home, Brand in town makes the City of brotherly love a more attractive destination for players seeking a possible contender. Sixers fans can look forward to a finish right up somewhere near the top of the Eastern Conference. The only thing that will stop them from winning the Atlantic conference is the presence of Boston, and they’ll push the Celtics at any rate. Ron Artest in Houston, with Tracy McGrady and Yao Ming? Wow… seems like an amazing roster. Not only these three, but think Rafer Alston, Luis Sciola, Shane Battier, Brent Barry, Carl Landry and even Dikembe Mutumbo – and you have a roster that’s loaded with talent. Verily, how loaded this team became at forward makes one wonder whether Battier’s destined to remain a Rocket too much longer. However, whilst this team might just perform at phenomenal standards, it’s just as likely to fall flat on it’s collective face. 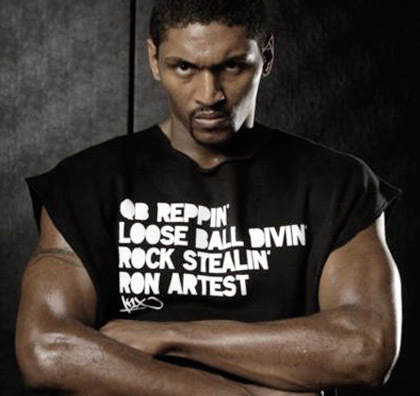 Ron-ron brings more luggage to Houston than just his suitcases, and whilst he’s been on his best behavior recently, it’s a toss of a coin as to who is more likely to commit something on a truly Vickian scale: Artest or ‘Melo. Within days of being named at his new team, Artest and Yao were butting heads, something that appears to have been resolved… but at the very least, not a good sign nor a good start. Add to that admittedly minor concern (unless… he goes off like, well… like a rocket), the fragility of Yao Ming, and to a lesser extent Tracy McGrady. Even tho’ Yao claims his limping at the Olympics was nothing more than blisters, the fact that even with surgery for a broken bone in his foot Yao had to play in the Olympics, would be of concern to Houston. But he did have to play – he’s Chinese, and it was Beijing. A foregone conclusion. What is the likelihood that Yao will be able to play a whole season this year? Well… not good. The last three years, Yao Ming has missed substantial time each and every season – each time due to a lower extremity injury. Despite seeming to be a relatively inconsequential injury, “foot stress fractures” occur due to repetitive pressure, something that’s of concern for a player of his size. It’s honestly not a good sign for Ming’s longevity. The Rockets will be good – but an injury to one of their key 3 personnel will leave them floundering. Toronto’s acquisition of Jermaine O’Neal puts them towards the top of the East, if O’Neal can return to a semblance of the form he had 2+ years ago. Alongside the amply talented Chris Bosh, O’Neal will have less pressure than he faced at Indiana in recent times, and should return some good numbers in scoring and rebounding. But can O’Neal stay healthy? 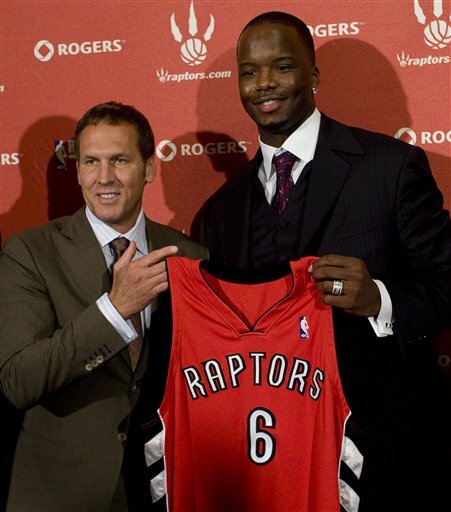 Along with O’Neal, Toronto drafted Australian big man Nathan Jawai – who steps onto the hardwood at a massive 6’10/280. Jawai’s raw, and largely untested… but with his sheer size it will be interesting to see if he can make it with the game’s elite. Now that Toronto have 4 players who are 6’10 or taller (not that Bargnani plays particularly ‘big’), surely they’d be able to make a real push in the East? Well… not so fast Rap-fans. Unfortunately for the Rap-pack, they dwell in the Atlantic division… which with the Brand-to-76ers move, has become perhaps the most top-heavy divisions in the East. Toronto will make the playoffs, but they will rely largely on which Jermaine O’Neal turns up – the superstar of Indiana two years ago, or the oft-injured lumbering big man of the last few years. Let’s hope for the former. It’ll make life interesting.